TALLAHASSEE, Fla. – Today, Governor Rick Scott and the Florida Department of Economic Opportunity (DEO) are proud to announce the official start of the 2017 Paychecks for Patriots events, which connect veterans with great careers in their communities. 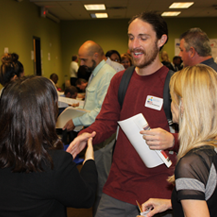 To celebrate Veterans Day this month, DEO is partnering with the CareerSource Florida network, the Florida National Guard, the Florida Department of Veterans’ Affairs and participating Florida employers to hold job fairs for veterans and their families. CareerSource Florida centers across the state will be hosting Paychecks for Patriots events Nov. 6-10, 2017, to help build connections between veteran jobseekers and Florida’s job creators. The employers will include national companies, as well as many local employers. More than 1,800 military and veteran candidates and their family members who participated in prior Paychecks for Patriots events across the state have gained employment. The CareerSource Florida network includes more than 155 workforce professionals statewide, themselves veterans, who are dedicated specifically to assisting other veterans with finding employment year-round. These professionals include specialists who provide intensive services to meet the needs of veterans with service-related disabilities. The CareerSource Florida network helped more than 54,200 veterans with employment services this past year. Events will be held across Florida during the month of November. More details are available at www.floridajobs.org/paychecksforpatriots. View Governor Scott’s 2017 Paychecks for Patriots proclamation by clicking here.